Google’s Search Console (GSC), formerly Webmaster Tools (GWT) is the go-to for many people looking to determining the performance of their website. Many SEO firms and Third-Party vendors build tools entirely around Google’s Search Console API. For individuals its a warm-and-cozy-and-FREE source for search rank reporting. GSC data and related reporting is so ubiquitous that you would assume it must be, well…ACCURATE. What if Google’s search rank reporting is inaccurate or plain erroneous? 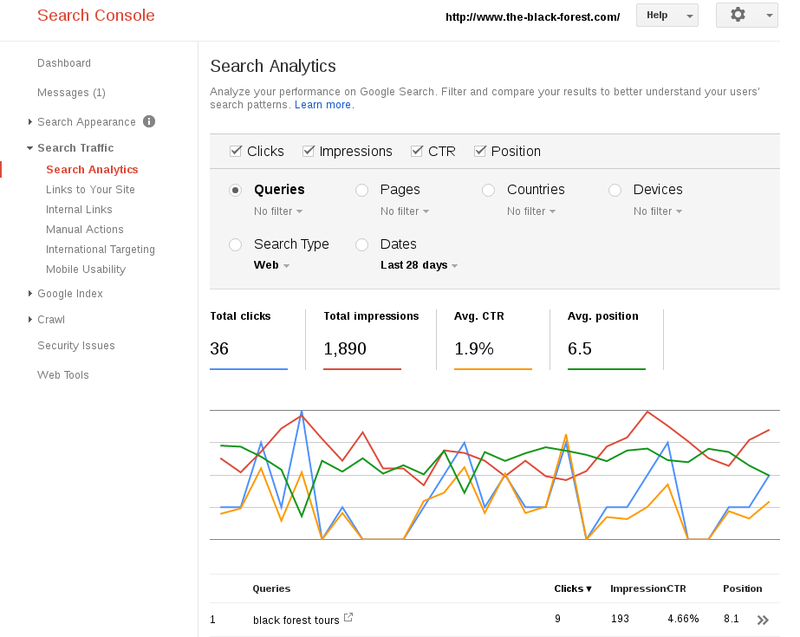 We stumbled upon this issue because Google’s Search Console told us a client’s website (www.the-black-forest.com don’t click here yet!) ranks an average 8.1 for their brand name keyword (black forest tours). That didn’t make sense. We’ve seen the website perform magnificently in search. It simply crushes all competition. So before you click-through and corrupt your personalization bais, conduct your own search for “black forest tours” and tell us in the comments what position the website got in your SERP. We searched from many different locations using different computers, employed SearchStation*, called some friends around the world to remove any personalization or location influences, and the website is in fact usually in the #1 spot and sometimes #2 – consistently for an average rank of 1.3 – globally! Search Console increasingly offers some useful tools for the webmaster, SEO, and business, but search rank reporting is not one of those. You can use SearchStation* to get accurate real-world search rank reporting and other valuable analysis. Are there others questioning or challenging the accuracy of search rank as reported in Google Search Console? Yes. …My message to everyone: think about data quality and validity before using Google Webmaster Tool data for your research, predictions or reporting purposes. It is ok to analyse trends and movements, using individual data points is not recommended. …Call me unsurprised, but this wasn’t even close. Standard rank tracking methods performed far better at predicting the actual number of clicks than the rank as presented in Google Search Console. We know that GSC’s rank data is an average position which almost certainly presents a false picture. *We build SearchStation for exactly these reasons, and more, accurate search rank checking is impossible to get any other way. The site ranked #1 for me too, searching from Manchester, UK. The question I have over Search Console/Search Analytics though, (presuming for a moment that it is not corrupt! 🙂 ) is how does Google calculate the rank for a keyword which ranks very differently depending on the location? E.g. we have 19 locations in 19 cities, so we rank differently in each location. These are the 19 locations we really care about – the real world locations our customers are located. So does Google carry out a search from a range of locations around the country, and give us the average of all these rankings? Or does it just take the rank from one location, e.g. London? George, thanks for the confirmation. If you have 19 locations that you care how they appear in search results to your real-world customers, there is no other way to measure those locations SERPS than to physically visit each area (location) and search just as your customer might search (from home, from a mobile device) for your (business) and record the positions. And assuming you have more than a few keywords relevant to your business, thats a lot of work that few people have the time to do – and that is what I built SearchStation to do for you. George. Thanks. I’m vainly hoping you were the only one who experienced that. Always embarrassing. But for those who did see those redirects that caused all kinds of dead-ends, it was a frustratingly difficult to locate conflict between Apache caching and the WordPress theme I was using. All fixed now.